The purpose of this article / tutorial is to give basic step by step instructions on how to apply and use rotor temperature paint. Rotor temperature paint is one of the most cost effective ways, even at the highest level of professional motorsport, to keep an eye on brake disc temperatures. Knowing and understanding the operating temperature of brake discs will allow one to make more informed decisions as to how to manage rotor temperatures. IMSA Ford GT Brake discs with rotor temperature paints applied. clean the applied brake disc surfaces free of contaminants and other dirt. Contaminated surfaces may not allow the temperature paint to oxidize at the right temperatures which may lead to false information. 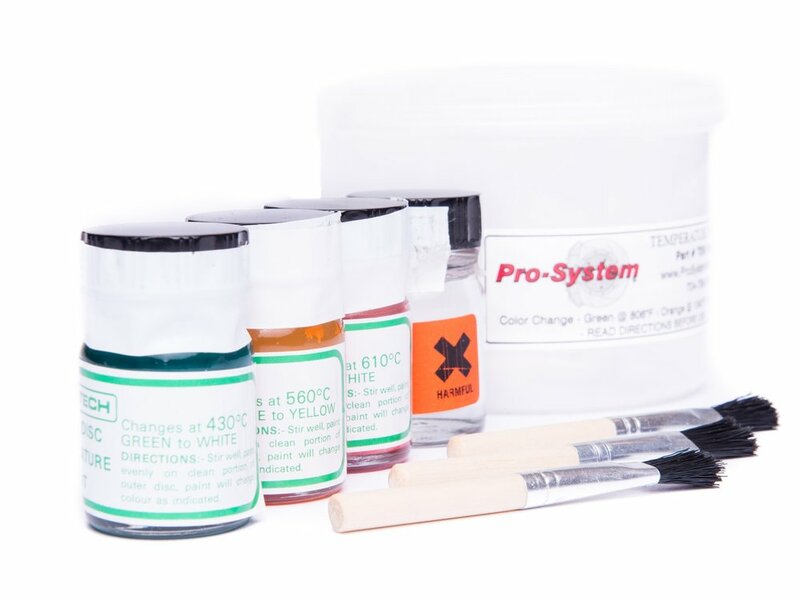 Thoroughly shake all bottles in the rotor paint kit so that the viscosity of the paint is consistent and well mixed. Designate and use individual paint brushes for each color of rotor paint.Do not mix the different paints and brushes as the temperature tolerance of each paint is different. Mixing the paints and brushes could lead to false temperature readings. Apply each color in the specific order of temperature thresholds. The Green paint oxidizes at the lowest temperature, while the red paint has the highest temperature resistance. Be sure to apply the paints to the friction rubbing surfaces and inner vanes of the brake disc. There are variations in the temperature at the rubbing surfaces versus the inner vanes (disc core temperature). Make sure the rotor temperature paints are applied to all four brake discs (front left, right, rear left and right). The individual paint(s) – Green, Orange and Red will oxidize when they reach a sustained temperature on the friction surface and in the vane. The ideal minimum temperature of the brake disc should at least oxidize the green paint. The maximum safe temperature for a brake disc should result in oxidizing of the red paint on the friction surfaces but not the red paint inside the vane. Brake discs with new rotor paints. Brake discs with rotor paints oxidized. The average rotor temperature exceeded 560°C. We can see that the rotor surface temperature was greater than 610°C. However, the vane temperature was less than 610°C, but greater than 560°C. Do not use the Orange rotor paints on carbon ceramic or carbon-carbon brake discs. There are specific ingredients in the Orange paint that will damage carbon ceramic or carbon-carbon materials.